Prior to every operating session, I go around the layout and do a general cleaning. I also straighten things up and make sure that uncoupling tools are in place, pencils are sharpened, and there are enough track warrants on the clipboards hanging from the fascia at various locations. Before the last operating session, as I was cleaning up the area around west end of Big Chimney, I came across something curious. There was a small blob of what appeared to be grey plastic next to the stream bed. Upon closer observation, it appeared to be a small campfire. Curious, I picked up the small piece and examined it. Sure enough, it was a campfire. If you look carefully in the photo below, you can see it through the bridge. Now I am absolutely certain that I never placed this piece of plastic here. I can remember just about everything that I've ever done on the layout, and I can assure you that this is not my work. So who, then, could be responsible for this? 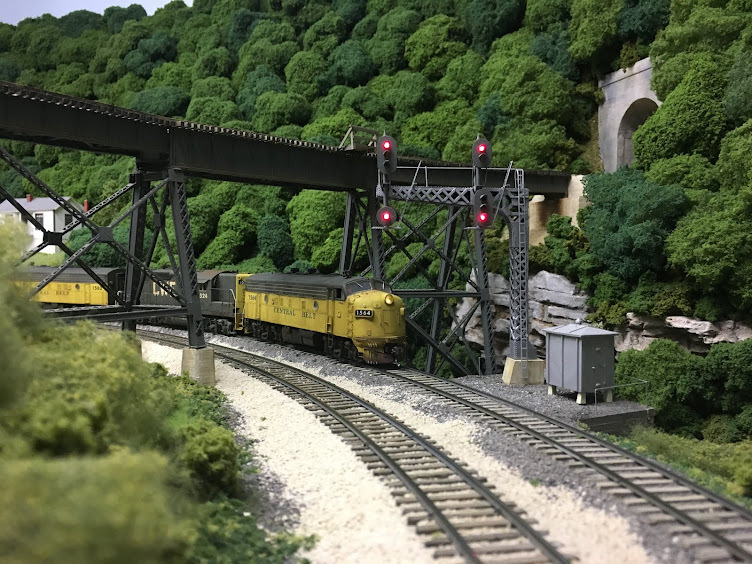 Just prior to the operating session back in August, two of the more shady members of the crew were back in this area of the layout looking very intently over the bridge in the picture above. They didn't know that I had come around the corner at the opposite end of the aisle and had observed them. Given their reputations, I came back after the session to see what mischief they have may have created. A quick scan of the area showed nothing amiss, so I almost felt guilty about having assumed they were up to no good. Almost. Now it's clear that I was correct. And we know who is responsible for the mysterious campfire. I'm not one to go around pointing fingers or naming names, but let's just say that one of the miscreants is known to abscond with freight cars at every available opportunity and the other is known to refer to railroad executives traveling on special movements as the "circus train." The good news is that, given their advanced years, I'm sure they have both long forgotten about this little incident. A friend of mine gave me a box full of GP parts, including a complete G18, for use in some kitbashes in the future. Looking through the box reminded of the times when I would spend hours adding super detailing parts to old Athearn Blue Box engines. It was lot fun, but it was also a lot of work. Looking through the box also reminded me of the first kitbash I ever did- an SD 40. Below is a shot of 3004 at SJ cabin. The unit was kitbashed using an old Athearn SDP40 and a GP35 shell. I used a how-to article in RMC from the late 1970's- early 1980's as a guide. At the time, there were no commercial models of SD40's or SD40-2's available. I planned to have a large number of these units on the railroad, and this project seemed to be a good solution. Numerous Details West and Detail Associates parts were added, and new handrails were formed from .015 brass wire. I believe the article described how to make a powered unit, but this one is a dummy. This was also the first diesel to receive the "new" paint scheme that was introduced in 1966 with the large "CWE" herald on the side and "Central Belt" on the nose. Note that the CWE herald is smaller than on all subsequent units. It was done using Champ Block Gothic 3/8" decals, and I quickly decided after completing the unit that the CWE needed to be larger. This unit was finished in 1982, and it took a lot longer than I thought it would. Fortunately, within a year or two of finishing this project, there were SD40-2's on the market with much better detail and accurately scaled hood widths. While this project was fun, kitbashing a fleet of these would have been a real challenge! Just before the start of the last operating session, Bob Zoellner handed me a box and said "Merry Christmas." The box was labeled as an undecorated Kadee 50' PS-1 box car kit. I thanked Bob and started to take the kit back to my workshop. He said "Open it up." I took the lid off and found what you see in the picture below. Bob made numerous modifications to the car. The roofwalks were removed, the holes filled in, and roofwalk brackets were added. The car was then painted and lettered as SOU 43029. The subtle weathering is beautifully done, and the working cushion underframe is amazing! It will make a great addition to the fleet and will be in service for the next session. Bob is a FRA licensed engineer who works weekends on the Lebanon Mason Monroe Railroad just north of Cincinnati. He has also become the regular dispatcher on the Chesapeake, Wheeling & Erie. His knowledge of railroading has brought a new level of realism to the operating sessions and it's been a real treat to listen to him get trains over the road. He was also responsible for getting me a cab ride on the LM&M- the first one ever- in one of the original NKP GP30's that's been repainted into its original paint scheme by Bob. Here's a link to photos of the engine: http://www.rrpicturearchives.net/locopicture.aspx?id=161478. Thanks again for the nice gift, Bob.